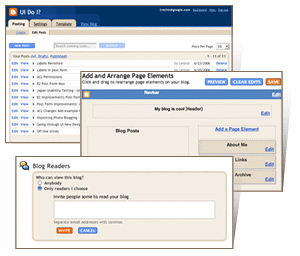 We've improved Blogger in a big way! In order to take advantage of it, you'll need to complete two simple steps to claim your blogs. Don't worry, your blogs won't be changed in any way. Use your Blogger username and password. We'll take all the blogs under this account and switch them to your Google Account. After you sign in, we'll have you choose which Google Account you'll use to sign in with from now on. You can create a new Google Account or link to your existing one. Drag and drop page elements and easily change your template's font and color scheme. Create a blog visible to just your friends and family, not the whole world. Give your posts a category label so that you and your readers can easily sort by topic.